This page will serve as the publishing requirement for ordinances and resolutions passed by the Momence City Council at its regular meetings. You must have Adobe Reader in order to access. These documents will appear for approximately 30 days, after which time the documents will be archived at the bottom of this page. Passed at the December 18, 2017 City Council Meeting. RESOLUTION NO. 199 - A RESOLUTION AUTHORIZING THE TRANSFER OF FUNDS LISTED IN THE ANNUAL APPROPRIATION ORDINANCE. ORDINANCE NO. 2018-840 - AN ORDINANCE ESTABLISHING RULES FOR REPORTING AND ADMINISTRATION OF HARASSMENT CLAIMS. Passed at the January 2, 2018 City Council Meeting. Need to pay an Ordinance Ticket? GovPayNet is a privately contracted credit and debit card processor under an agreement with the agency intended to receive payment. If the payment is bail or bail-related, GovPayNet is the merchant of record, providing a remote cash bail processing service. For all other payments, the collecting agency is the merchant. If you have any questions about GovPayNet's role, please discuss them with the contracting agency. 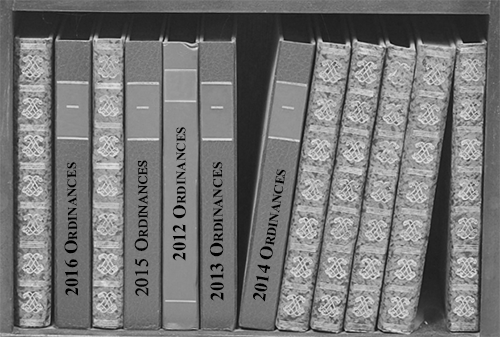 Click on the book title below for previous years' ordinances and resolutions. Please be patient, as these books are quite large and may take a while to load.